We believe everyone should stay updated on trending news stories, and be able to do it quickly and easily. With Vizo News you'll know what's happening in your world in the time it takes to order a cup of coffee! Vizo reads the news for you. We replace headlines with images, our editors summarize each trending story into a Glance, and then we link you to a variety of full-length sources. Isn't it time that someone gave you the news the way you want to read it? 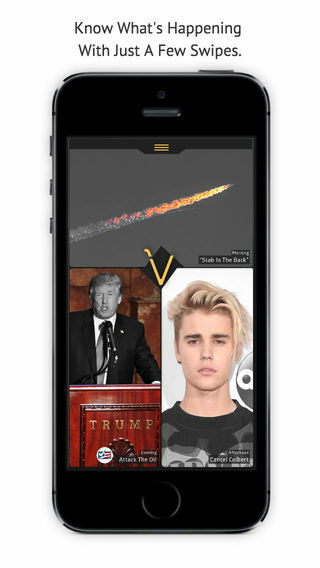 Vizo: Your World At A Glance. Next. -Catch up on stories from our amazing partners like Cinema Blend, Dan Rather, John Boitnott, Factcheck.org, Spoon University, FIT, Columbia University, and more! -With 3 updates a day — morning, noon, and evening — you’ll never miss a thing. -Get a taste of everything as you scroll through various categories from politics and business to sports and celebrity. The people have spoken and we heard you. If you were having issues with notifications coming in delayed or coming in twice, our dev team has spent the past week not sleeping. Many Red Bulls later, we are happy to report that the notifications are now flawless.